Established over 30 years ago after Carol returned from Thailand where she had lived for many years training in goldsmithing and studying gemstones. 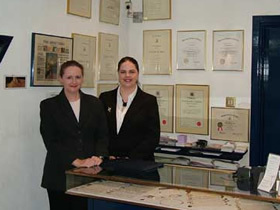 Over the years, Carol continued to study and train in gemstones and today she is Irelands first and only female member of The Institute of Registered Jewellery Valuers in London and Irelands first female Fellow of the institute in London. Carol is a full graduate Gemmologist from the Gemological Institute of America and Fellow of the National association of Goldsmiths of Great Britain. Carol Clarke Jewellers is a family run business specialising in diamond engagement rings and unusual gold jewellery for thirty years. 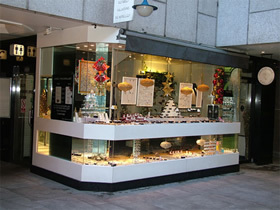 We are situated in 7 Royal Hibernian Way Dawson Street Dublin 2. The business was first started by Carol Clarke over twenty years ago. Carol, FIRV., FNAG., G.G (GIA), AJP (GIA), P. J. Val Dip, R.J Dip, BJIG, trained as a goldsmith in Bangkok, Thailand, while studying jewellery design at the Bangkok Jewelry Institute. Carol also studied at the Asian Institute of Gemological Sciences in Bangkok. After her training, Carol came back to Ireland and started her own business designing and making unique pieces of jewellery in gold, platinum and silver. Carol also studied with the National Association of Goldsmiths of Great Britain and holds the Retail Jewellers Diploma with distinction. 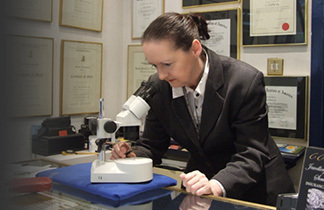 Carol is also the only person in Ireland to have completed the Gemological Institute of America Insurance Replacement Appraisal examination which is just one of a number of gemological examinations that Carol has achieved. 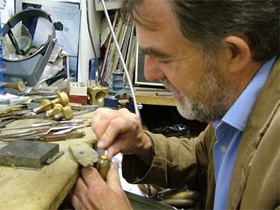 Carol FIRV., FNAG., G.G (GIA), AJP (GIA), P. J. Val Dip, R.J Dip, BJIG works with her husband Eamon who also studied art in Dublin and who has won numerous awards over the years for his designs and workmanship as a goldsmith.Colette also holds a Retail Jewellers Diploma from the National Association of Goldsmiths of Great Britain. Ann, Marie and Sandra also hold various jewellery qualifications from various jewellery associations, so together we make a group of very qualified jewellers! We feel that we offer you a very high and informative standard of service. We are sure you will find something of interest on our site from our Claddagh rings, Celtic engagement rings, Ogham rings, Claddagh pendants, Celtic wedding bands, etc.